Towards the end of 2012 Nick Papadimitriou’s Scarp was published; a new model - ‘deep topography’ - for contemporary drifters and dérivistes was made generally available. Tina Richardson’s short book of collected blog posts, drift accounts and essays is every bit as important and importantly connected. For Richardson cites Papadimitriou’s self-definition (and our own ‘mythogeography’) as provoking her own hybrid creation: ‘schizocartography’ which maps “contradictions while simultaneously reclaiming the subjectivity of individuals by enabling new modes of creative expression.... challeng[ing]... the homogenizing character of overriding forms”. It would be easy to accuse Richardson (and us, too, of course) of introducing a self-serving differentiation (and it has worried us in the past). One of the many virtues of this book is that Richardson offers such self-differentiation not as a carving out of theoretical territory, but as a necessary personal re-defining. In other words, to really ‘do’ psychogeography as a “new mode[s] of creative expression” it is necessary to become it and change it, to remake it in an individuated practice, to rework it in one’s own shifting image. And, sure enough, Richardson, in no sense in a self-serving way, mythologizes herself, fabulously and limitedly, as Madame Psychogeography. All this in a series of short pieces that emphasise their consistency with psychogeography as first modelled by the International Lettristes and situationists (IL/SI). There is no contradiction here. Richardson never makes claim to any privileged ground or persona: indeed, exemplarily, when she visits Los Angeles she is both tourist and psychogeographer; “neither anarchic nor customary”. It is exactly in these moments of distorting and distending the practice that it is practiced; subjecting it to subjectivity; mapping its psychogeographical effects onto her own subjectivity: “I started to feel disconnected like I was cocooned in cotton wool. The sensory overload had actually turned into nothingness, something meaningless and beyond recognition. I suddenly had no frame of reference and got the sensation of being sucked out of the material dimensionality of the mall into the space just behind it.” So when Nick Papadimitriou “become[s] the town centre” it is not a metaphor, but a fanciful map of a space for others to tear up. If there is a general crisis of psychogeography – in public debates about anglo-psychogeography, at least – then the hierophant in the room is the effect of ‘earth mysteries’ and the literary occultism of the likes of Peter Ackroyd, Alan Moore and Iain Sinclair. For every enthusiast, there seems to be a psychogeographer who feels their materialist legacy has been stolen from them. Yet, what Richardson seems not only to sustain, but, without hectoring, to model, is the suggestion that the way back to the materialism of the IL/SI – “the study of the geographical environment, consciously organised or not, on the emotions and behaviours of individuals” – is through subjectivity and individuation, not its renunciation; and by implication, a multiplicity of means. Richardson’s account of Papadimitriou’s method – “investigat[ing] the urban detail at its fundamental microbe-level” – is exactly this generosity in practice. 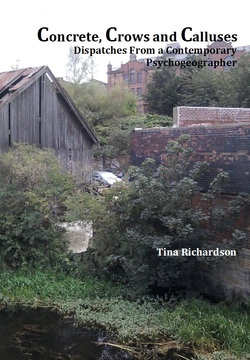 To “[keep] ahead of ‘the psychogeography industy’”, Richardson proposes not a return to a “generalised psychogeography” unable to summarise the breadth of the practices made in its own name, but one that seizes on just such difficulties of definition as “part of its enduring nature”. There is no role for followers in this psychogeography, but for partners who will make their drifts as individual as Richardson’s; her achievement is to exemplify this within the context of a restatement of simple IL/SI principles. Not for sectarian purposes, but as re-usable tools. It would be easy to miss the significance of this book. Tina Richardson has not constructed a new theoretical mesh. She has restated some key ideas, mostly through descriptions of their practice. And she has created her own practical versions of them. But in doing all that she has – in her own making of dérives, rather than describing what they should be – done something much greater; she has shown us what psychogeography can be; generalisable by individualisation. There will be lonelier, stranger, happier places to come.